When DC Direct decided to branch out with "DC Unlimited," World of Warcraft wasn't the only property they picked up. They also rolled the dice with the imported anime Afro Samurai. The show was only five episodes long (not exactly a full series) and aired on Spike (not somewhere people were likely to watch it), but it still drew attention for at least one thing: the English dub starred Samuel L. Jackson. The story revolved around the titular warrior looking for revenge against the man who killed his father, and along the way, we learned his history - including what had happened to those he had to leave behind on his quest. 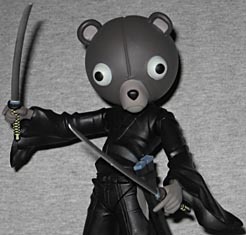 Despite the horrible disfigurement that left him trapped under a powerful and twisted mechanical teddy bear helmet, Kuma's two-sword technique is still intact and even further enhanced by his cybernetic implants. But underneath this frighteningly powerful warrior remains the troubled mind of a good friend of Afro whose life was snuffed out too early. In order to get a shot at the man who killed his father, Afro found out he had to defeat Sword Master, his former sensei. Though Sword Master took it in stride, not all the students did, which is how Afro ended up fighting his best friend Jinnosuke. Jinno was messed up pretty badly in the fight (as you might expect of anyone unfortunate enough to be on Samuel L. Jackson's bad side), but was saved and returned for his own vengeance. And apparently he's never stopped crying since that day. Kuma definitely matches the show's design asthetics - very angular and twisted, with huge exaggerated flares in his costume. 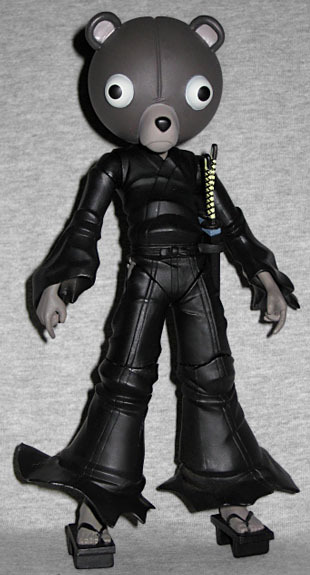 He's wearing an all-black gi, with a black sash around his waist to hold his swords in place. The hems of his clothes are sculpted elements, flowing naturally over the folds of the material, and there is a slit over each hip. 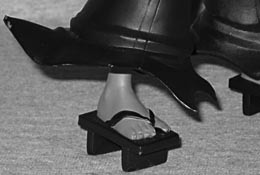 He's wearing tall geta sandals - you know, the footwear that's traditionally, stereotypically Japanese? With the two vertical slats on the bottom? Yeah, those. What really stands out about Kuma is his teddy bear head. Yeah, a samurai with an afro is one thing, but a warrior with a giant, ursine mask? Not something you see every day. The head is nearly a perfect sphere, with a seam down the center, little ears poking up from the top, bulbous eyes that look in different directions, and a blocky snout with a bit of a frown on it. The head is soft pvc and hollow, which makes it a bit squishy - it pops off the neck easily, too. If not for being on the body of a swordsman, this head would look right at home on a cute little bear. And of course, "kuma" (熊) is Japanese for bear. Kuma is armed with his two swords, which fit nicely in the scabbards - they slide in and our easily, without catching or sticking anywhere. The 2¼" blades are silver, and the braided grips are light yellow. Actually, the entire paint scheme is rather muted: Afro Samurai is animated in a nearly grayscale style, with just faint hints of color throughout - and dark red blood, of course. There are a few times when a color really pops, but in general, the show is almost black and white, and the figure matches that. It's not like the character is actually meant to have grey skin, you know? Articulation is, like most DCD products, sub-par. Kuma has a ball and socket head, balljointed shoulders, hinged elbows, v-crotch, swivel thighs, and hinged knees. 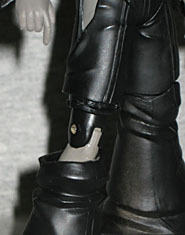 The edges of his outfit are soft rubber, so they don't get in the way of the articulation; it's so low to begin with, losing any would have been a pain. But even with that, there's just not enough movement to do justice to a crazy martial artist like Kuma. If you're interested in Kuma, you might not want to buy this figure. See, DC Unlimited announced that they'd be making a four-figure series, but what they failed to announce was that they'd also be offering an exclusive two-pack of Kuma and Afro through FYE, Suncoast and all their related stores. Not only do the figures in the two-pack have unique blood-splattered paint apps, the set also includes a second, replaceable head for Kuma. When he removes the teddy bear mask, we see Jinnosuke's scarred cybernetic visage, and that's what the alternate head depicts. 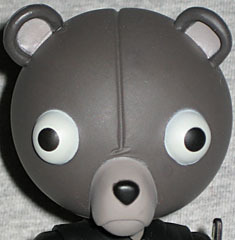 Certainly explains why Kuma's head pops off so easily, but why wasn't this included with the single-carded version? Kinda feels like we got cheated. Jinno looks like he's lacking a neck without the bear head on, but it's still better to get an extra than not to get it.